It doesn’t matter what seat you choose on an airplane, your view will never be as breathtaking as what the pilots get to see during your flight. 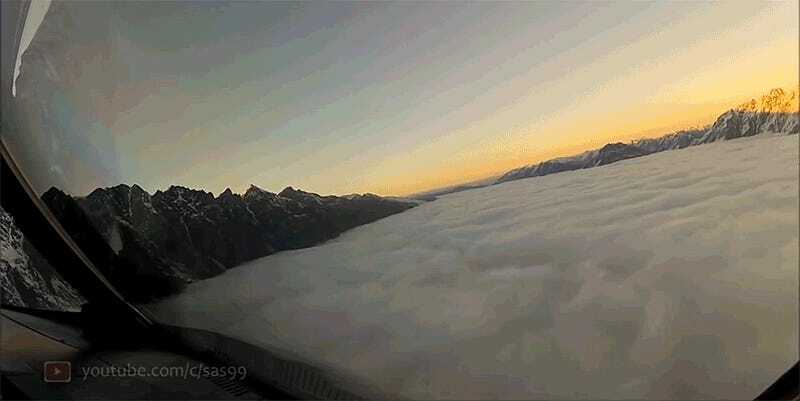 But sometimes the high-altitude scenery is so stunning that pilots feel obliged to share it with the world, like this descent into Queenstown Airport in New Zealand. If you ever wondered what made Peter Jackson choose to film so much of his The Lord of the Rings trilogy in New Zealand, just remember this footage comes raw from a cockpit camera without any special effects added. There’s a layer of hanging clouds around the plane that looks like it might have been conjured by a dark wizard determined to prevent the plane from landing, but the plane eventually safely touches down on a runway.